I was all set, months ago, to show you this photo of us eating outside in May. I was all set to write, “SEE, there is still sunshine in Piha” come and join us. Even Hua helped us enjoy the lingering summer by having a birthday. Then, suddenly it was winter! And I had a nasty dose of Shingles! Life became somewhat painful and limited for me. But Winter went on in its own way redesigning the stream so it ran parallel to our road and doing amazing things to the ocean! People started to notice their high level of stress as the dark nights and grey days became more frequent. 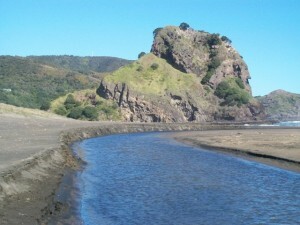 Requests came asking for time out at Piha. And they came enriching our winter months. “I need to unwind, catch my breath and regain my balance,” one said. Winter walking was done in spite of gales or rain though most opted to wait for the sunshine! But they knew how to dress for the weather! Others found the shelter of bush tracks and Garden Road and walked anyway! The dinners around the fire became a necessity! Some came to do a week’s study; several came for a week of spiritual direction and rest. One good friend came to help me cut back the hedges and trees that were keeping the sun off the Chalets. Some came to sort out health or food issues and Karen’s just the one for that job. Tourists came from overseas. One to die, actually. But while here life became precious again and she returned home to her family. Several groups came to hold workshops. One tourist made a video of her visit and we’ve put it on our website, thank you, Elda. Our Winter Special Rate of $295 from Monday – Friday was popular and Winter was quite fun as we listened to stories of traffic jams, examination finals and wet washing hanging around in car-ports – all left behind for 3 – 5 days! The GOOD NEWS is that we are extending the Winter Special Rate only $295 Monday to Friday until the end of the year! I’m perceiving something NEW about Te Wahi Ora. Susan can get the months financial details sorted in a new time record and Karen and Hua have found a new way of making Kale enjoyable from a recipe given by a guest from Hamilton, thank you Barbera. But even more than all that … I think I have a new perception about Te Wahi Ora! 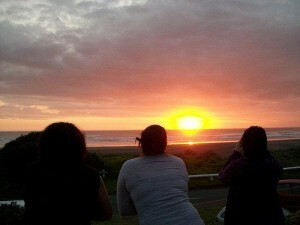 What I see happening here at Piha, seems to be happening all around! For example. I’ve been listening for some years now to a young woman talking about her childhood trauma of home-life; her shock of recognizing that she had been repeating this childhood disaster in every relationship and that now, she is doing everything she can to choose to live differently. Gradually I began to see something new in her story. She and her partner with their rented house on a chunk of land that provides sustenance to an assortment of live-stock family and friends, are creating a Te Wahi Ora (a place to belong to while moving into wholeness) in an Auckland suburb! No conscious intention to do so, but because of their choices to heal and grow spiritually, something wonderful is happening! A woman told me, she is often taken-aback by folk saying, “thank you for letting me stay at your home, it’s been wonderful!” “It’s just a house,” she said to me looking puzzled. Over the years, her house has been enriched by the people who have come and shared her journey of moving into wholeness. Perhaps her family and friends did not realize that as they received, so also they created something ‘wonderful’ that another resident or visitor, at some stage, would need. I keep listening to people’s stories in this new way. It gives me hope for the future. We, who have gone through the pain of looking at our past, forgiving ourselves for the choices we made back then, and slowly, painfully (often), made new choices and created new ways of living. Unbeknown to us, we have been creating Te Wahi Ora’s, i.e. homes where we and others ‘can belong to while’ we all move into wholeness! A solo mum and 2 teenagers, creating a Te Wahi Ora out East. A somewhat overcrowded flat in west Auckland. A family flat in Central Auckland. Another on the north-shore. One in Ponsonby. No one is mentioning the name Te Wahi Ora, but I can see these houses becoming what we at Piha have been seeking to create for 20 years, a ‘haven for others to belong to while moving into wholeness”. Is this the power of women and of our healing? Is this a new, emerging concept of HOME? Even the ‘space’ in which we live can become places of healing for ourselves, our family, our friends, anyone open to or needing the healing energies. Probably this has been true for some, ever since houses were invented! 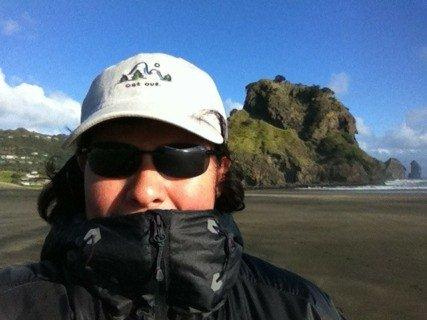 But I believe that, the more women have a Te Wahi Ora to escape to regularly, Piha or elsewhere, while their own healing journey is happening, the more those women will be creating a Te Wahi Ora in their own house! That is how it seems to be working! “You never change things by fighting the existing reality,” says Richard Buckminster Fuller. Is this what we are doing with our experience of HOME? We wish you all the very best as Spring really gets underway.